Naperville City Officials Say It’s True, It Must Be….Right? Recently Naperville made 267 proactive repairs to installed smart meters. Naperville city officials said that this type of thing is going to happen. And when it does happen, it’s not the fault of the smart meter itself, it’s because of loose connections and corrosion in customer-owned meter bases. So Naperville city officials are saying it’s the customer’s fault. It’s not the fault of the city. No, that can’t happen that the city of Naperville could be at fault. City officials including city manager Doug Krieger, supported by the city council, said it’s true so it must be true..right? City officials have no idea why residents would be skeptical. Residents should be happy these so-called smart meters were forcefully slapped on homes and and businesses in Naperville in a very nefarious manner. Is it any wonder why Naperville residents and business owners have intense distrust for city officials. There is absolutely no amount of evidence that could be presented to Naperville city officials that would cause them even the slightest doubt to consider they made a huge mistake. The Smart Meter project was spear-headed by city manager Doug Krieger, and council members Grant Wehrli and Bob Fieseler. In nearly every step of the ill-conceived process Naperville city officials made decisions that have been and will be detrimental to the residents and business owners of Naperville. So now the city has no choice other than to blame house fires on residents and business owners. The same thing will happen when security is breached, health issues arise, privacy is compromised, and electric rates soar. Blame it on the people. Can anyone remember the last time a city official apologized for a blunder, let alone a huge error in judgment? Can anyone remember the last time a Naperville city official stood tall and accepted responsibility and accountability for causing inconvenience and grief to the good folks of Naperville. No, it’s much easier to simply blame it on the good folks of Naperville. A lot happens within the inky shadows that Naperville city officials roam. Much of what is said and done is not good. And one thing we’ve yet to hear from a Naperville city official is an apology about anything. Blame it on the homeowner. Often times we make it much too difficult to do something. We think the more elaborate we make it, the better it will be. Maybe we need to rethink how we do what we do, and make it more simple. Take for example electing the mayor of Naperville. It won’t be long and that process will begin. Folks announce their candidacy, campaigns begin to take shape, big dollars are donated, campaign signs appear everywhere overnight, softball questions are tossed at candidates, typical sound-good answers are given, a small percentage of eligible voters vote, we watch the numbers roll in, somebody gives a concession speech, someone else claims victory, and everything goes back to the way it was before the election except for a new face at the center of the dais. If the vote was held today, the best candidate would also be the worst candidate, since we only have one announced candidate. Councilman Steve Chirico is the only person with enough courage to raise his hand when the question “Who wants to be the next mayor of Naperville?” was asked. Maybe there is a better way to elect the mayor. Maybe a better way to get more people involved, keep expenses low, eliminate campaign signs, and avoid concession speeches. The city of Dorset, Minnesota has figured out how to do it, and it’s working. Residents ‘love’ their mayor, the local police fully support the mayor, and nobody is calling for the mayor to resign. Dorset, Minnesota is a tourist type of town known for its restaurants and shopping. There are no traffic jams, no Smart Meters, and no $435,000 legal settlements from the city coffers to roughed-up citizens. No, it’s nothing like Naperville. The city of Dorset, Minnesota keeps it simple and it works. Meet the mayor of Dorset, Minnesota, Robert “Bobby” Tufts. Mayor Tufts keeps its honest and keeps it simple. Now of course, in politics, there is always going to be a little negative campaigning, but nothing that Mayor Tufts can’t rise above. Keeping it simple, and keeping it honest worked; the mayor was re-elected to a second term. According to the mayor’s mom, the mayor’s agenda includes “raising money for the Ronald McDonald House “Charities of Red River Valley in Fargo, N.D., and a new welcome sign for Dorset.”It sounds like a town where people are truly ‘Welcome’. Let’s set the record straight, I have been a Cubs fan since dirt was new. I have seen some bad Cub baseball over the years and the last two years it’s been some of the worst. With a little more effort on their part, they could end up with close to 200 losses since 2012. I know a little bit about baseball having played semi-pro ball back when the ball was square. I learned quickly that you have to be really good to make it up to big show, and I realized just as quickly that I needed to find a different career. I also know a little bit about leadership. It’s easy to see when it’ there, and when it isn’t. The benchmark is ‘results’. Sadly to say, Naperville city officials are sorely lacking in that all important dimension; you see it in the results. So based on that, I wondered what would it be like if Naperville city officials had a baseball team. Which of our city officials would be best suited to play which position in the first game of a double-header. This is what it might look like. Joe McElroy (1st base) Seems to lack a little energy, so keep him close to the dugout so he won’t have to run as much. Judy Brodhead (Catcher) Vertically challenged, so when she’s standing she looks like she’s squatting in the catcher’s position. Bob Fieseler (Left fielder) He’s so far out there, and so far left, that’s it’s difficult to see him. Doug Krause (Shortstop) Wants to turn the double-play, but no one covering second base to get the job done. Doug Krieger (Manager) It’s been said, if you can’t hit, and you can’t field, and you can’t run, you might as well be the manager to tell others how to hit, field and run. Mayor George Pradel (Announcer) He’d be like Harry Carry; no idea what’s going on, but makes it fun to listen to him. Margo Ely (Official scorer) Knows the rules and always favors the home team that pays her. Grant Wehrli (Right Fielder) Keep him as far away from the action as possible, since he specializes in making errors. Paul Hinterlong (2nd baseman) Seems to relish in being second, stumbles occasionally, an prone to getting spiked. Steve Chirico (Starting pitcher) Good control, instills confidence, and can lead a bunch of misfits. Dave Wentz (Center Fielder) Covers a lot of ground, and makes those around him look good. Police Chief Bob Marshall (3rd baseman) Can handle balls hit like a bullet, and can make the hard tag when necessary. Fire Chief Mark Puknaitis (Relief Pitcher) He can put out the fire, and keep the heat on opposing batters. Joe McElroy (Ticket taker) Seems like the kind of simple job Joe would excel at, and he’s good at keeping the line moving. Judy Brodhead (Mascot) Would not need to wear a costume; she’s good to go as is. Bob Fieseler (Parking lot attendant) He’s good at squeezing people into small places like electric vehicles. Doug Krause (Umpire) He calls it like he sees it, and is willing to get booed when making the right decision. Doug Krieger (Concession stand) He tells us it’s all healthy and good for us, when in fact, it’s all unhealthy and bad for us. Mayor George Pradel (Scoreboard keeper) He might get the 6’s and 9’s confused, but he’s good with the rest of the numbers. Margo Ely (Money counter) Somebody has to watch, count, and organize the money. Grant Wehrli (Disgruntled overpaid bench warmer) Not a team player, likes to complain, and mistakenly considers himself most important. Paul Hinterlong (Usher) Offers to help you find your seat, but inevitably takes you to the wrong seat. Steve Chirico (Grounds keeper) Who better to keep the field looking good and the lines straight, than the successful owner of a flooring company. Dave Wentz (Ticket seller) I’d buy a used car from him, so I surely would buy a ticket from him. Police Chief Bob Marshall (Security) He likes to station security at all the entrances/exits to intimidate well behaved fans. Fire Chief Mark Puknaitis (Paramedic) Nobody can perform a better Heimlich on a hotdog. Given the choice between keeping most of these city officials in their current position of “leadership”, or starting a baseball team, I say we get the balls and bats and pick out a team name. Some of the better names are taken including, Montgomery Biscuits, Lansing Lugnuts, Toledo Mudhens, and Lehigh Iron Pigs. This has not been a good week for Naperville city officials as they continue to lose credibility with Naperville residents and others in the Chicago-land area. This seems to be a common reoccurring theme for the city council, and for city manager Doug Krieger. It all stems from a dismal lack of leadership, which places residents in a financial squeeze, while compromising the safety and well-being of more than 143,000 residents. Since the first of August there have been 28 home burglaries in Naperville, many of which were committed while residents were at home. Prime time for these break-ins appear to be late Friday and Saturday nights on the city’s north-northwest and south-southeast sides. During Tuesday night’s city council meeting, police chief Bob Marshall appeared uneasy and at times nervous while fielding ‘softball’ questions from council members. Though he tried to position the burglaries as not that unusual, nobody that I know bought that logic, and in fact the television and radio media hasn’t either. The problem rests squarely on the shoulders of the Naperville city council for three reasons. First, because of the abundance of liquor licenses in downtown Naperville (and the number continues to increase), a high number of police are assigned to a relatively small downtown area in an attempt to minimize alcohol-fueled ‘dust-ups’, bar brawls, and all-out illegal activities. Since they have to focus on that, they can’t be doing their jobs in the neighborhoods. Secondly, there are an unusual number of police officers at every Friday night Naperville Central football game. I along with a couple of friends have gone to high school Friday night football games throughout the Chicago area for years, and nowhere do we see the saturated presence of police officers as we do in Naperville. And finally the Naperville city council appointed the assistant city manager as the police chief, when the previous chief retired. If the largest city in Illinois, and the smallest city in Illinois have genuine police officers by definition as their police chiefs, shouldn’t Naperville. This all comes during the same week that the City of Naperville settled an ‘excessive force’ lawsuit for $435,000. The lawsuit was brought by a Lemont woman who suffered a torn rotator cuff when she struggled with Naperville police officers in 2010. Since the city is self-insured, the $435,000 settlement is coming from the police department’s budget. Those are huge dollars that could have been used to hire additional police officers, who then could be patrolling Naperville neighborhoods. It’s likely those 28 burglaries wouldn’t have been a news story. Has Naperville Become Like America? 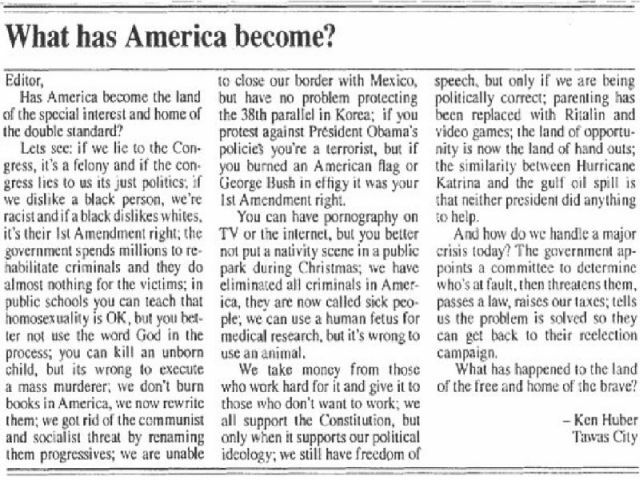 “What Has America Become” is the title of a “Letter to the editor’ of the Iosco County News Herald, published on June 9, 2010 in the Opinion column. It was written by Ken Huber of Tawas City, Michigan. It contains a series of comparisons and contrasts which prompts one to consider the double-standards and conditions under which we now live in America. Though I am not in total agreement with some of his points, the general question he presents remains relevant. We can ask those same questions here in Naperville; What has Naperville become, and what has happened to the land of the free and the home of the brave. This couldn’t be more evident than in the case of resident Kim Bendis, when she was arrested under the direction and abusive power of Naperville city officials for protecting her family and home from the forced installation of a smart meter on her home.. Kim Bendis was also charged with documenting the city of Naperville’s forced entry onto private property; the same documentation that CBS Channel-2 News was recording. Another Naperville mom (Jennifer Stahl) was also cuffed and arrested at her home for protecting her home and family. Both women’s cases are working their way through the court system. Naperville city officials have been relentless in attempting to persecute and “pound” these women into submission, as if they were pinatas or political toys of the Naperville city council, and specifically council members Grant Wehrli and Bob Fieseler who spearheaded the Smart Meter program orchestrated by city manager Doug Krieger. In city official’s attempt to demonize the actions of both women, it hasn’t worked. In fact, councilman Grant Wehrli has decided to ‘run’ away for a state representative position distancing himself from the Naperville city council. It’s doubtful he can outrun the Smart Meter fiasco, and chances are it will follow him on his campaign trail. Any money donated to his campaign fund, might be better used at a casino, where the return on investment would be better. As for Kim Bendis, she came to ‘the land of the free’ (see link below) and is now one of the “home of the brave”. The article in World Vision Magazine is both heart rendering and encouraging for both America and Naperville. Parades are fun and always worth a good laugh at some point of the procession. 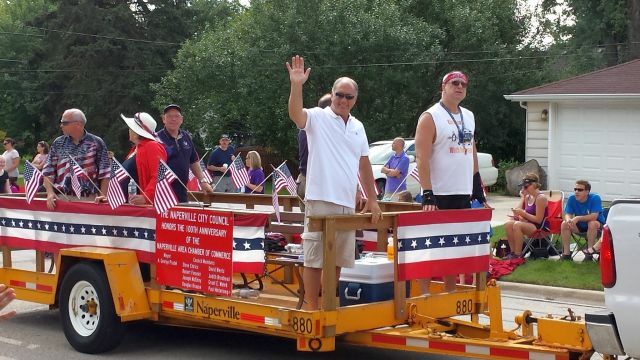 At this year’s Labor Day Parade in Naperville that point came when two-thirds of the Naperville city council appeared on a very cleverly decorated flat-bed trailer hauled by a gas-guzzling truck. It probably would have been more impressive if the nine-member council was stuffed into a two-door electric vehicle (like clowns in a telephone booth) in their effort to promote the convenience, practicality, and comfort of electric vehicles. Where is Mayor Pradel, where is councilman Grant Wehrli, and somebody else is missing but who? The big question, of course, is which of these council members looks like he lost a bet, because surely he wouldn’t dress like this by choice…would he? At the time councilman Fieseler probably thought it was a good idea, but then again he also thought Smart Meters and electric vehicles were good ideas too. Councilman Hinterlong looks as though he just got thrown out of Black Finn and is looking for a fight. In the back by himself (just as he is in council votes) is councilman Doug Krause, astute enough to know where the camera is, and looking like he’s out for a day of fishing. Then you have councilman Steve Chirico, the only announced candidate running for mayor, looking as though he should be the mayor; smiling, waving, acknowledging the camera, and dressed perfectly for the occasion, relaxed and confident. Behind Chirico is either council member Joe McElroy or Dave Wentz. The residents don’t look very excited or even interested. If it wasn’t for the sign on the side of the flatbed, residents might think the riders are recent graduates of Elgin State Hospital, a rehab center somewhere, or a prison work-release program. Then we spot councilman Grant Wehrli wearing somebody’s shirt and receiving a two-person standing ovation. That has to be depressing; a picture of utter despair. Was he not allowed to ride the council member flatbed, wasn’t he allowed to at least wear his own shirt. 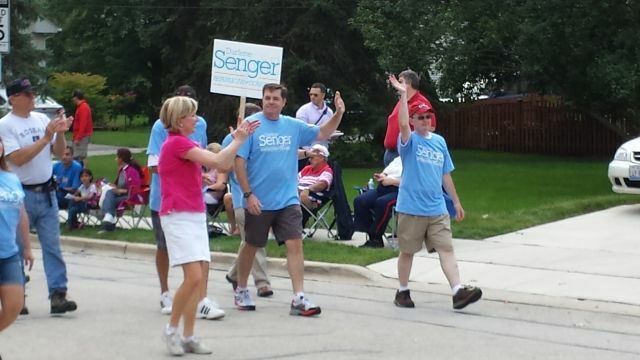 As the parade ends, we are still left with two questions: Who is the missing ninth council member, and what was councilman Fieseler thinking on Labor Day morning. Maybe he was thinking ‘Halloween’. Naperville residents are feeling the pain every time they look at their electric bill. In fact, just about more pain than any other city in the state of Illinois, and in the country. And what’s causing this pain? Answer: over the top electric rates. And that begs the question….why? Answer: really bad decisions by Naperville city officials. The Naperville city manager, Doug Krieger, along with the Naperville city council specialize in two types of decisions; bad decisions and really bad decisions. In this case, Naperville city officials ‘got taken to the cleaners’ and ‘played’, by paying for far-above-market electricity rates with a dreadful decision to finance the Prairie State Energy Campus in southern Illinois which is a coal-powered plant. The high cost of electricity in Naperville may account for the inky shadows in city hall corridors. As bad as the rates are in Batavia, Geneva, St. Charles, and Winnetka, they look great compared to Naperville’s atrocious electric rates. On the other hand city officials in Chicago, Barrington, Bensenville, Downers Grove, Evanston, Glenview, Hinsdale, and Lake Forest look like geniuses compared to Napervillle city officials, because they didn’t invest in Prairie State. Chicago itself is paying 25% less than Naperville, and Naperville is paying the highest average rate of the five Chicago-area municipalities that buy electricity from Prairie State Coal. The story was reported by Michael Hawthorne, a Chicago Tribune reporter in the Tribune Watchdog Update, Wednesday September 4. Naperville city officials have kept residents in the dark (pun intended) about the outrageous cost of electric. City officials made no mention of their once-again poor judgment in decision making. However the ‘cover-up’ was uncovered, not only by Michael Hawthorne, but also when Naperville residents opened their electric bills. Those comments were actually made regarding their position on the always family-friendly ‘Cage Fighting’ events held in Naperville, but they could and should apply to their horrendous decision to invest in a deal that hurts Naperville residents. At least in ‘Cage Fighting’ the participants do-so by choice, whereas residents had no choice in the bogus Naperville electric rates deal. Council members Chirico, McElroy and Wentz were not on the council when this awful deal was approved, however it’s about time that other council member’s are held accountable for what would be described as, “What were they thinking” when they voted ‘yes’ on this issue. Are we about to hear another loud chorus of resident disenchantment requesting and demanding that city manager Doug Krieger resign. It might be far less expensive for Naperville residents if they simply sent him on a lengthy cruise around the world. A brilliant observation about nature and those little nuances that we overlook. A stunning revelation that water, not in the pipeline, is better outside of the home, rather than inside. Can there be any doubt why Naperville city officials are known for their pinpoint and uncanny ability to isolate issues and apply creative solutions. Yes, there can be a lot of industrial-strength doubt. One can only wish that Naperville had true leadership. Now, as Paul Harvey would say, for the rest of the story. The two homeowners made their presentation to the Naperville city council because the city staff suggested they bring their concerns to the city council. And what was the bottom-line recommendation that the council made to those homeowners? You guessed it. The council directed the two homeowners to take their concerns to the city staff. 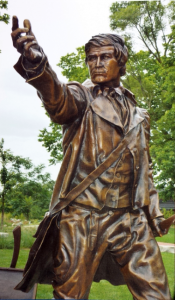 Friday August 23, Naperville city officials unveiled a nine and one-half foot tall statue of the city’s founder, Joe Naper. He was considered a leader and an entrepreneur, and to put it simply, a shaker and a mover; he helped make things happen. He was involved in shipbuilding, he built a lumber mill and a trading post, helped dig a quarry, along with building homes. Also in Naperville, he mapped out the streets and surveyed the land. He was the first village president, and served in other elected positions including the Illinois State Legislature. He was an advocate of fairness and freedom, and while he was firm man, he also placed a high priority on his family, including his brother John, and John’s family. I don’t think anyone would have wanted to get between Joe and his family’s safety, well-being, and freedom. What would Joe have done, if on some dark night, members of the Fieseler clan, the Krieger gang, and the Wehrli brothers, came riding on their horses out of the inky shadows, and jumped over Joe Naper’s homestead fence and tried to attach unwanted and dangerous items such as kegs of gun powder and torches (similar to today’s Smart Meters) to Joe’s house against his will, while Joe and his family along with his brother John were inside. One could only imagine, that on that evening at the southeast corner of Jefferson Avenue and Mill Street, where Joe’s statue now stands, those “branches of the Fieseler, Krieger and Wehrli family trees, would have been forever pruned by Joe and John”, and the members of Naperville city council would look quite different than it is today. However, here we are today, and we simply have to make the best of it. At least we have Joe Naper’s statue, all 1500 pounds of it.